Since 1975 there has been a 6-fold increase in the routine use of EFM on low and moderate-risk mothers. This reflects a long and honest search by the obstetrical profession to find a dependable way to eliminate cerebral palsy and the many other neurological disabilities associated with the baby’s birth. 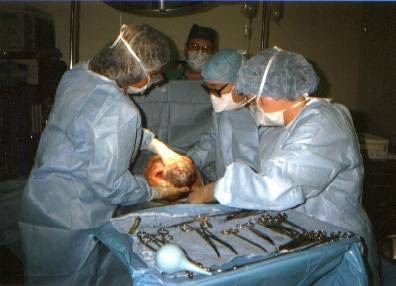 Obstetricians fervently believed the that expanded use of EFM, when combined with cesarean section, was the much prayed for modern answer to the eternal problem of birth-related brain damage. EFM is now the most frequently used medical procedure in the US, while C-section is the most performed surgery in American hospitals. Out of approximately four million births a year, it is reliably estimated that 93% of all childbearing women are continuously hooked up to EFM equipment during labor. [citation L2M Survey 2002 & 2006; Martin et al 2003] Many health insurance carriers reimburse hospitals at a rate of $400 an hour for continuous use of EFM during labor, so the expense to consumers and society for such a policy is extraordinary. All this is true in even though a consensus of the scientific literature has never supported the routine use EFM on healthy women with normal pregnancies. A 2006 meta-analysis aggregated the data from randomized controlled trials done during the 1980s and 1990s and found no change in perinatal mortality or cerebral palsy rate when electronic fetal monitoring was used during labor. However, study on the efficacy of EFM did identify a significant increase in operative deliveries and Cesarean section rates for women who had continuous EFM during labor. The only positive association with continuous electron monitoring was a very small reduction in neonatal seizures, but this did NOT result in any overall improvement in infant wellbeing. Another recent study noted that continuous EFM was only able to detect potential cases of cerebral palsy during labor 0.2% of the time. Yes – you read that right – 1/5th of 1.0 %. This mean that EFM is UNABLE to reliably detect the kind of fetal distress that leads to cerebral palsy 99.8% of the time. 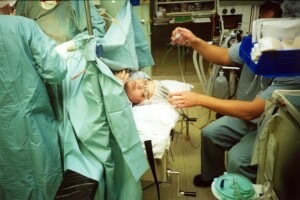 This is not because the electronic circuitry of the EFM equipment is flawed, but because the premise is incorrect – cerebral palsy can neither be reliably detected nor prevented by EFM during labor because only about 8% of all neurological complications for newborns have any possible association with events of labor or birth. It turns out the at least 92% of newborns with the neurological problems that later will be diagnosed as CP already have the critical brain damage before their mother’s go into labor. Researchers are still not sure exactly why this happens but ‘best guesses’ so far are maternal infection and unidentified genetic factors. The facts are determined by brain scans done on symptomatic newborns within 24 hours of birth. If damaged areas of brain tissue are already able to be visualized, then the damage happened during the pregnancy. This is in sharp contrast to birth-related trauma, which does not show up on brain scans for at least 48 hours. This kind of biological delay can be seen when we bump into the corner of a table but it takes a couple of days for the bruise to become visible. Since the pregnant woman and her fetus are apparently both free of any symptom of this problem, the only way to distinguish between babies who will have permanent neurological damage after birth would be to do an MRI or CAT scan on all pregnant women in the last few weeks of pregnancy. While economically this is not feasible (and might itself lead to deleterious side-effects), it would end the obsession with continuous EFM as a key part of the defensive practice of obstetrical medicine. “Chez et al. (2000) noted that EFM technology came to be widely accepted before proof existed of its efficacy and safety. ACOG (2005) noted that the various methods of intrapartum EFM currently used are not effective in predicting or preventing adverse long-term neurologic outcomes. When EFM is routinely used on low and moderate risk populations with normal pregnancies (more than 70% of all laboring women), it introduces unnatural and unnecessary risks. One of the reasons is a consistent difficulty in interpreting fetal monitor information – the inability of the nurse or obstetrician to look at the last 30 minutes of the EFM strip and reliably determine whether or not the fetus is compromised at a level requiring an emergency C-section. It is also impossible to tell from the EFM strip that a Cesarean done at that particular time would reasonably guarantee a baby free from permanent neurological problems unless the baby simply doesn’t actually have any problems in the first place. A great many C-sections are done for minor variations in the EFM strip afterward were found to be benign – a ‘false positive’. This fact is evident by the normal status of the baby at delivery, who comes out pink and crying, with normal Apgars. Abnormal EFM tracing are the second must frequent reason for performing a CS — 23% — but only 3.1% of these babies are diagnosed with fetal distress (hypoxia) at delivery. When the baby comes out with good Apgars, the doctors and nurses often comment that “better safe than sorry”. Considering the lengthy list of complications and unproductive expense associated with childbirth via major surgery, it’s never going to be the best choice. 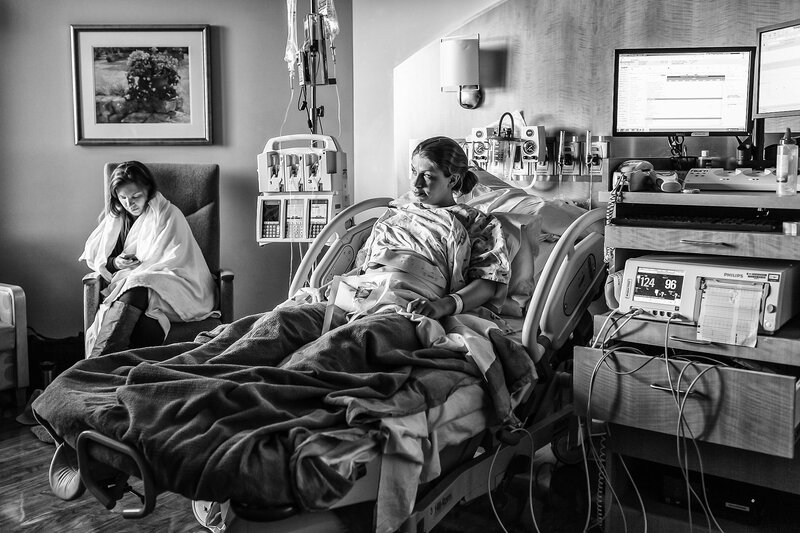 The obstetrical professional generally agrees that only about 5% of Cesareans done in the US actually prevent death or major disability for either mother or baby. With a current C- section rate of 33%, that means only 1/6th are functional. Findings from an excellent study of professionally-trained and regulated Canadian midwives found a C-section rate in OOH settings to be of 6.9% (after hospital transfer). No studies on have been able to demonstrate improved perinatal mortality from the use of EFM when it is compared to listening to fetal heart tones every 30 minutes with a hand-held Doppler for low-risk women. The alternative to EFM is called intermittent auscultation. A non-electronic fetoscope or Doppler and specific criteria is used to listen to the unborn baby’s heart rate on a regular schedule throughout labor — usually every 30 minutes in active labor, every 15 minutes in 2nd stage, and during the perineal stage (beginning to see baby’s head) every 3rd contraction and more frequent if any abnormalities are detected. Intermittent Auscultation during labor (IA). To calculate the fetal heart baseline rate by IA, and detect the presence and/or absence of normal viability, normal accelerations, and abnormal decelerations, the caregiver listens immediately following a contraction for one full minute while counting in 5-second sets. This sampling process is similar to the digital sampling process used by electronic monitors. The best equipment for intermittent auscultation is a hand-held fetal doppler with a speaker (so everyone present can hear the fetal heart signal) and a large battery operated clock with a sweep second hand that pauses momentarily with each ‘tick’. A typical baseline fetal heart rate (FHR; sometimes called ‘heart tones or FHT) in a healthy unborn baby is between 110 and 150 bpm. At is normal for a neurologically intact and awake fetus to have minor variations in its heart rate after 20 weeks of pregnancy and throughout labor. This variability is a biological marker of normalcy and shows up as slight, brief accelerations above the baseline that last for a few seconds and sometimes conclude with a slight and brief dip below the baseline. A frequently heard FHR is 144, a number I choose simply because it makes the math easier to describe. If a rate of 144 bpm is divided by 12 (the number of 5-seconds samples in 60 seconds), there would be, on average, 12 beats heard for every 5-seconds. But due to the expected (and normal) variability, the typical sampling during that 60-seconds would actually yield a series like this: 12, 12, 13, 12, 11, 11, 10, 10, 11, 12, 12, 11. The next time the caregiver listens, the baseline may be slightly slower @ 132 bpm (very frequent finding) as determined by a series of: 11, 11, 10, 9, 10, 11, 12, 12, 11, 12, 11. If the baseline rate is 152 (also normal, especially if the mother has been in a hot shower or bathtub), one would count: 12, 13, 14, 12, 13, 12, 12, 11, 12 13, 13, 12. All of these sequences are equally and decidedly “variable”. As already noted, variable FHR is described as reassuring of fetal well-being. Accelerations: During times of sustained fetal movement (repeated kicking, squirming around, etc), the baby’s heart rate accelerates up to as much as 168-180 bpm for brief periods of time (15 seconds to 2 minutes). This is considered to be a VERY good indicator of fetal well-being. Anytime a a non-stress test (NST) is done on pregnancy, the measure of a ‘reactive’ strip (i.e.you get to go home instead of going to the hospital) is at least 2 such accelerations over a 20 to 40-minuter period of time. If your baby is so active that it has 2 or 3 nice big, sustained accels right at the get-go, and also a normal baseline and normal variability, your baby has already passed its NST and you can go home happy. (a) Fetal heart baseline rate becomes abnormal when it is consistently below 110 (bradycardia) or over 160 (tachycardia). Determining baseline is very straightforward. Experts in this field have concluded that tachycardia (heart rate consistently over 160 bpm for more than 30-minutes and gradually climbing towards 170) is the very first indication that a fetus is experiencing some type of clinically significant stress. This is seen as a possible first step in a process that may, if both prolonged and uncorrected, lead to serious fetal distress. Tachycardia that does not respond to normal efforts, such as correcting the mother’s dehydration or cooling her down if she’s been in a hot shower, calls for medical evaluation. (b) A total lack of variations (flat baseline without any ups or downs) is considered to be a possible indication of fetal problems, such as a slowly developing hypoxia (unborn baby not getting enough oxygen). However, the most frequent reasons for a lack of normal variability are either temporary and benign or can be corrected, such as the unborn baby’s normal sleep cycle (a 20 to 90-minute fetal nap!) or the transient effects of narcotics given to its laboring mother. If a variable FHR is diminished or absent for longer than 30 minutes, intrapartum caregivers will listen with increasing frequently until variability returns to normal. Correcting any maternal dehydration often brings about the return of normal variability. But if simple corrective measures are not followed by significant improvement, the unborn baby may be in trouble and will need a more advanced form of medical evaluation. (c) Head Compression Decels: When a mother is actively pushing and the baby’s head is low in her pelvis, it normally gets quite a sustained squeezed with each contraction as the bones of the baby head pass by the major bones of the mother’s pelvis. Since fetal skulls are not ridge by design (the better to mold so they fit the size of the mother’s pelvis) this pressure often triggers the fetal equivalent of a driving reflex such as whales experience when they dive rapidly to greater depths. These are called ‘head compressions decels’. They temporarily cause the fetal heart rate to slow down as low as 60 bpm (88 to 108 more likely) in the middle of the contraction and then return to a normal rate and rhythm between contractions. This phase is usually short-lived; a well-oxygenated baby typically adjusts or accommodates to this noxious stimulus, or gets past that point in the pelvis, in about 10 minutes. As long as this phase does not go on too long, the decels are not below 60 bpm, there is prompt return a normal baseline (110-150) and other parameters are generally normal, this is a normal variation that accompanies pushing stage of labor in many women. One researcher (Wood, 2003) has gone so far as to suggest that the inability of continuous EFM to prevent CP and other forms of serious neurological damage, combined with the iatrogenic harm introduced by its use – forced maternal immobility, interpretative errors and increased C-section rate — is so great that informed consent should be obtained before continuous EFM is used on healthy women. 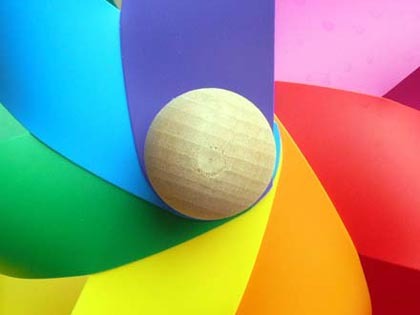 The even bigger issue than immediate and long-term complications associated with overuse of EFM/CS is obstetrical medicine’s denial of the mind-body connection necessary for labor start spontaneously and to progress spontaneously. For reasons that are unclear to me, obstetrical medicine, with few exceptions, is completely resistive to the idea the mother’s state of mind might have something to do with how her body is working. As a result, obstetrical norms for diagnosing “failure to progress” always assume there is something wrong with the mother’s uterus or pelvis, and virtually neve consider that it might have something to do with the mother’s emotional and psychological state. Labor is demonstrably a mind-body phenomenon. I personally assisted at Cesarean sections for “failure to progress’ on inordinately frightened women whose uterus were decidedly pale from a normal blood flow that clearly had no physical explanation except that their body was having a dramatic fight-or-flight response. 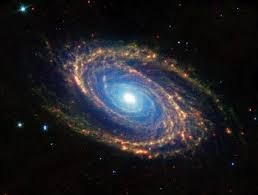 N that can easily be derailed by an unnatrual level of fear, or disrupted by the business of the L&D unit, by admitting and other hospital procedures that make women fearful, and by the immobilization that is an inevitable result of being tethered to the bed by EFm leads, to intensive care LDR room, where she will be progressively and inexorably tethered to her hospital bed with EFM leads, BP cuff, pulse oximeter, IVs, epidural paraphernalia, Foley catheter (and bedside bag), and last but not least, the O2 mask after the EFM tracing gets a little wonky. Laboring woman teathered to the bed w/ EFM cable and IVs. Two external monitor leads can be seen in the middle of her belly. The EFM screen tells us that the baby’s FHR is 124 and the mother’s pubse oxinetry is 96%. This ACOG task force report has the endorsement of six major federal agencies and professional organizations, including the CDC, the March of Dimes and the obstetrical profession in Australia, New Zealand, and Canada and is widely regarded as the “most extensive peer-reviewed document on the subject published to date”. “The increasing cesarean delivery rate that occurred in conjunction with fetal monitoring has not been shown to be associated with any reduction in the CP [cerebral palsy] rate… … Only 0.19% of all those in the study [diagnosed with CP] had a non- reassuring fetal heart rate pattern….. If used for identifying CP risk, a non-reassuring heart rate pattern would have had a 99.8% false positive rate [N.Engl. J. Med 334[10:613- 19, 1996]. A physician would have to perform 500 C-sections for multiple late decelerations or reduced beat-to-beat variability to prevent a single case of cerebral palsy. So I’ve prevented one case of cerebral palsy and I’ve caused one, concluded Dr. Hankins, professor and vice chair of ob.gyn at the University of Texas, Galveston. NOTE: Abnormal implantation of the placenta is a known complication of post-cesarean section pregnancies. These are life-threatening complications that frequently require an emergency hysterectomy to stop the bleeding. The condition is called a placenta accreta when it grows invasively into the muscular wall of the uterus. It’s called a placenta percreta when it grows through the uterine wall and invades the bladder, bowel or other abdominal structures. The mechanical process of this is very similar to the way malignant tumors grow into healthy tissue. A percreta always requires that an emergency Cesarean-hysterectomy be performed. Karin B. Nelson, M.D., James M. Dambrosia, Ph.D., Tricia Y. Ting, B.S., and Judith K. Grether, Ph.D.
Electronic fetal monitoring during labor was developed to detect fetal-heart-rate patterns thought to indicate hypoxia. The early recognition of hypoxia would, it was reasoned, alert clinicians to potential problems and enable them to intervene quickly to prevent fetal death or irreversible brain injury. When electronic fetal monitoring was introduced, it was hoped that the use of this technique would prevent the majority of birth injuries due to hypoxia or asphyxia, thus greatly reducing the frequency of cerebral palsy and mental retardation. The introduction and wide dissemination of fetal monitoring occurred before randomized clinical trials had evaluated its efficacy. More than 20 years and 11 randomized trials later,1-6 electronic fetal monitoring appears to have little-documented benefit over intermittent auscultation with respect to perinatal mortality or long-term neurologic outcome. Furthermore, probably in part because of the widespread use of fetal monitoring,  the rate of cesarean section has increased, with a resulting increase in maternal morbidity and costs but without apparent decrease in the incidence of cerebral palsy. Few of the trials performed so far have been large enough or have lasted long enough to investigate a possible association between findings on fetal monitoring and a relatively rare outcome such as cerebral palsy, which can be confidently diagnosed only years after birth. No randomized trial has explored possible associations between specific heart-rate patterns detected on electronic monitoring and long-term neurologic outcomes. In a population-based study, we assessed the association of cerebral palsy in children with birth weights of 2500 g or more with specific patterns on fetal monitoring and evaluated the possible confounding effects of other risk factors. We investigated the usefulness of fetal monitoring as interpreted by the treating physicians at the time of the delivery of infants who would later be given the diagnosis of cerebral palsy. 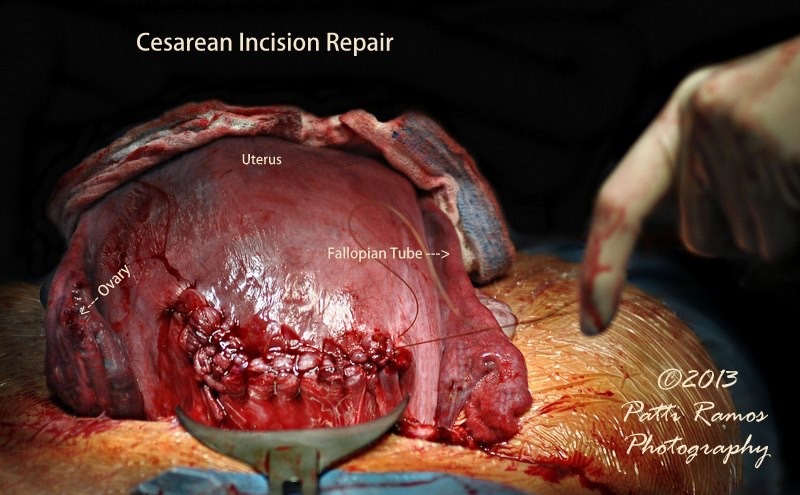 A normal aspect of Cesarean surgery is to repair the incision made in the uterus. This is usually done by lifting the uterus up out of the abdominal cavity and allowing it to lay externally on the mother’s abdomen. This is done to help the obstetrician see better and have easier access to the organ while he is suturing the Cesarean incision. If you look at the photo carefully, you will see arrows pointing to the mother’s left Fallopian tube and her’s right ovary. Obstetrician; Epidemiologist at the Centers for Disease Control for nine years. Currently serves as Vice President of Biomedical Affairs at Family Health International and Clinical Professor in the Department of Obstetrics and Gynecology at the University of North Carolina School of Medicine. Link on this website (FG.org) to list of 104 references used in the above document. This is a particularly useful resource, as every title has a link to at least the abstract of the study and many links allow you to access the full version. Also all the references are listed by topic, so all papers on various issues (such as EFM, amnioinfusion, epidural, etc) are clustered together.